The overall U.S. birth rate declined to a record low in 2011, but newly-released government data showed remarkably different trends for young and older women. Birth rates continued to decline to an all-time low among women in their teens and early 20s, while rising to the highest level in four decades among women in their early 40s. The final data for 2011 from the National Center for Health Statistics (NCHS) confirm the record-low birth rate (63.2 births per 1,000 women ages 15-44) shown in preliminary data released last fall, and offer the first details about trends for different demographic groups. During the period from 2010 to 2011, birth rates among teens ages 15-19 dropped 8%, and among women ages 20-24 declined 5%—in both cases reaching historic lows in 2011. At the other end of the age spectrum, the birth rate for women ages 40-44 rose 1%, to 10.3 births per 1,000 women in that age group. The last time the rate came that close was in 1967, when it was 10.6. Birth rates among women in their late 20s declined 1%, to the lowest point in 2011 since the 1976 bicentennial. Among women in their early 30s, birth rates held stable, while rates for women in their late 30s rose for the first time since the onset of the recession. The total number of births in 2011—3,953,590—represented a 1% decline since 2010. The age patterns in birth rates, and the continued overall decline, reflect trends that accompanied the onset of the Great Recession in 2007. 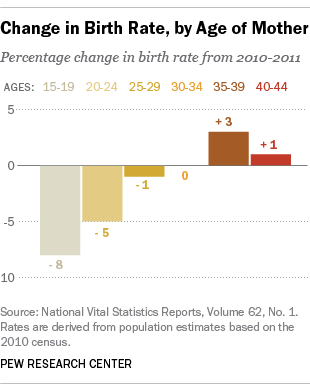 The U.S. birth rate, which had been relatively stable, declined 9% from 2007 to 2011. The pace of decline has slowed, however. From 2009 to 2010, the overall U.S. birth rate declined by 3.2%, and from 2010-2011 the decline was a relatively modest 1.4%. This slower decline may foreshadow what many experts have predicted: as the economy continues to improve, the fertility rate may be bottoming out and may begin a rebound in the years to come. D’Vera Cohn is a senior writer/editor focusing on immigration and demographics at Pew Research Center. Why is the teen birth rate falling?